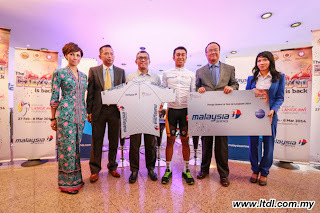 KELANA JAYA, Wednesday, 27th November 2013 - The white jersey that highlights the best Asian rider ofLe Tour de Langkawi will once again be supported by Malaysia Airlines for the19th edition from February 27 to March 8. This classification is amajor target for the regional cyclists as well as it raises outsiders’awareness of the progress of Asian cycling. 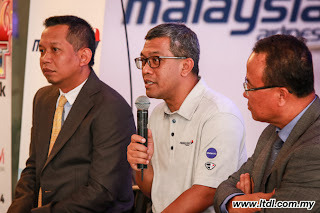 “Our association with reputable sporting events such as LTdL iscertain to promote Malaysia as an international destination for sports,business and tourism. MAS finds that sports tourism is a key enabler inproviding that support for growing yields where our foreign visitors are keento spend on quality products and services during their stay in Malaysia.”Muzammil continued. 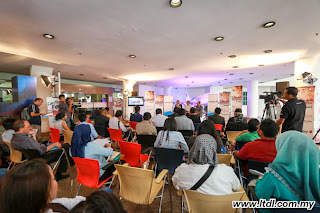 He added, “Meanwhile, Malaysia Airlines is currently offeringattractive domestic fares through our Year-End Specials (YES) for immediatetravel until 30 June 2014. We urge race enthusiasts to book now and secure thebest value for their travel should they wish to follow the race in February2014. These deals are made available on all Malaysia Airlines distributionchannels mainly www.malaysiaairlines.com, Malaysia Airlines’ Call Centre 1 300 88 3000, Malaysia Airlinesticket offices and appointed agents throughout Malaysia”. Also present in the sponsorship ceremony were Chairman of the LTdLOrganising Committee Dato’ Seri Zolkples Embong, Malaysia Airlines’ Head ofStrategic Communications Dato’ Najmuddin Abdullah and Deputy Chairman of theLTdL Organising Committee Dato’ Hj. Ab Jalil Abdullah. “Officials at the international cycling union (UCI) keep saying thatcycling is growing faster in Asia than anywhere else in the world”, noted LTdLchief operating officer Emir Abdul Jalal. “We’re proud to be part of that movement. With all the participationsrequests we get from Europe, America and Oceania, we could ignore Asian teamsbut that’s out of question.” Emir added. Le Tour de Langkawi is the highest ranked stage race on the Asia Tourwith a UCI 2.HC status like Chinese events Tour of Qinghai Lake and Tour ofHainan. Every year, approximately half of the starting teams hail from Asia,usually Japan, Korea, China, Taiwan, Indonesia, Singapore, Iran, Kazakhstanand, of course, Malaysia. The best Asian rider competition has been created two years after theinception of Le Tour de Langkawi in 1996. The individual classification hasbeen won successively by riders from Indonesia, Japan, Hong Kong, Iran, Korea,Kazakhstan and more recently China as Wang Meiyin made history for his countryin 2013. The 25 year old from Qufu in the Shandong province already wore theMAS white jersey of best Asian rider when he struck the world by winning soloin the Cameron Highlands on stage 3. In the inaugural stage, he claimed allthree intermediate sprints and collected enough time bonus on a flat terrain toposition himself in the top three overall prior to the mountain stages. Atop Genting Highlands, he limited his loss to maintain a tight fiveseconds advantage over second best Asian rider Amir Kolahdozhagh from Tabriz.At the end of the ten-day long event, he finished fifth overall and king of themountains as well. “Wang’s epic ride made the 2013 Le Tour de Langkawi a very interestingone”, Emir remembered. “It’s been the best ever performance by a Chinesecyclist worldwide so far. Therefore, the impact in international mediahas been terrific for LTdL and Malaysia.